Herbert and Katherine Jacobs House, Madison, WI - Prototype of Wright's Usonian design concepts. Two buildings in Wisconsin are included in a nomination of Frank Lloyd Wright's work to the UNESCO (United Nations Educational, Scientific, and Cultural Organization) World Heritage List. The nomination, titled "Key Works of Modern Architecture by Frank Lloyd Wright," includes a total of ten of Wright's designs. The Herbert and Katherine Jacobs House in Madison, and Wright's own home at Taliesin in Spring Green are among the ten. The Jacobs House (1936-37) was the first execution of Wright's Usonian concepts - his model for low-cost, well-designed homes for middle-class suburbia, developed during the Great Depression. The Jacobs introduced new design concepts to American residential architecture that resonated into the post-war decades, including an open interior plan, and rear-orientation of the living space and bedrooms. 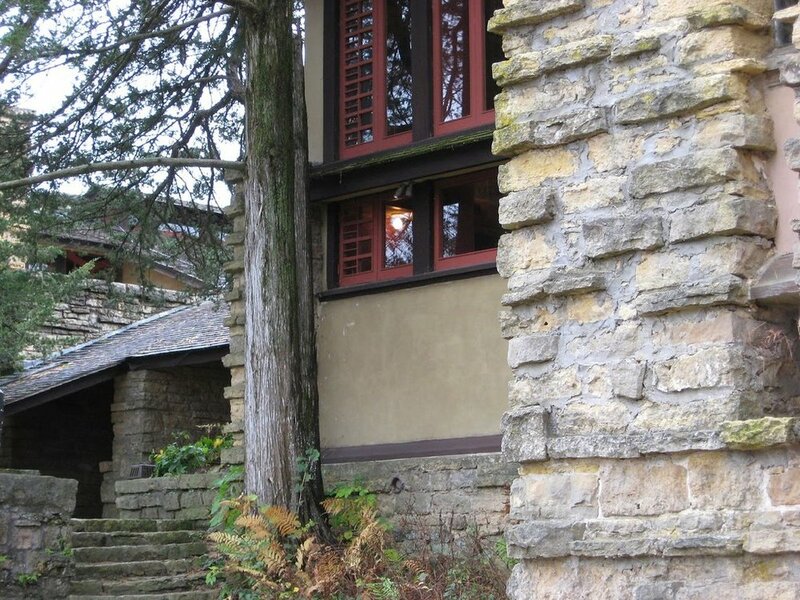 Taliesin was Wright's own home near Spring Green from 1911 until his death in 1959. It's a sprawling complex that includes the main house, a theater, a school, Wright's studio, farm buildings, and The complex served as a laboratory where Wright developed his concepts and methods, and where he taught his ideas to apprentices. The World Heritage nomination is currently under a review that includes visits to each of the ten sites by UNESCO representatives before it is formally submitted to UNESCO by the US Department of the Interior. Designation as a World Heritage site provides no protection for listed sites, but it raises their profile among travelers who want to visit sites of cultural importance, and draws international attention to their historical significance. UNESCO's World Heritage List currently includes 1031 sites, of which 802 relate to cultural history (as opposed to natural history). Twenty-three of those are located in the United States. The 10 Wright sites could be added to the list in 2016. The Wisconsin Historical Society will host the 9th annual Local History and Historic Preservation Conference in Middleton on October 9 and 10. Featured presenters include Wisconsin Tourism Secretary Stephanie Klett and prize-winning journalist and Frank Lloyd Wright scholar Ron McCrea. The conference offers sessions and workshops for history and preservation organizations, professionals and volunteers, history buffs, museum collection curators, even development directors. There are also opportunities for unique tours on Saturday, including the USDA Forest Products Laboratory, Frank Lloyd Wright's Unitarian Meeting House, and Taliesin.